What does the future of travel hold? Here's how you find out. Our friends at Skift want to take you on a Tour of the Future of Travel. Enter to win below. LOOKING BACK at how we used to travel is always an interesting exercise. Matador did it recently in the post The 6 most significant changes in travel in the last 20 years. It’s fun to consider the decades-long evolution of the industry, and marvel (and laugh) at how it used to be. It’s much more challenging, of course, to cast our gaze in the opposite direction. What will the future of travel be like? If you’re working in the industry, how will you be affected by changes in the next one, two, or 20 years? More importantly, how can you help effect those changes? And now, you have the chance to win an all-expenses paid trip to the Skift Global Forum. On Day 1 of the tour, you’ll learn about the future of the hospitality experience firsthand by staying at the Gansevoort Park Avenue NYC, which has the first heated indoor/outdoor pool in the city, a tri-level rooftop with striking views of the Empire State Building and Manhattan skyline, and a ground-floor trattoria, Asellina, offering Italian-inspired fare. Once settled in your room, you’ll network with the Silicon Alley-based founders of HitList, AllTheRooms, and BonVoyaging, active disruptors across different areas of the travel industry. 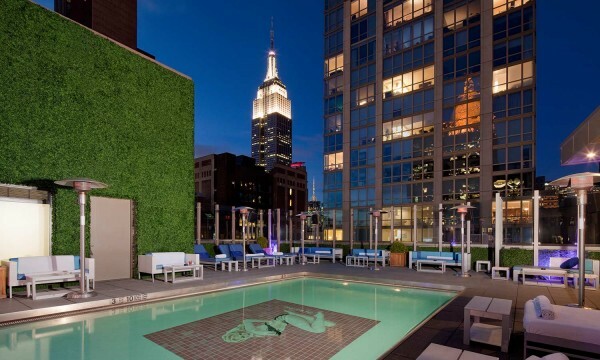 Afterwards, opt to unwind with a cocktail on the Gansevoort Park rooftop, or visit Exhale Spa to give yourself time to brainstorm some ideas for your own startup. On Day 2, you’ll attend the Skift Global Forum to learn about the changing trends in travel across sectors, geographies, and functions. Hear from the head of global hospitality at Airbnb, the former CEO of Virgin America, and other top executives on what is shaping the future of the travel industry.